With the advent of modern frameworks, ES6 and the increasing risk of security every day, knowing how to use Chrome developer tools can give you a major boost in productivity and help in the easy diagnosis of a website’s performance. This article aims to give an overview of different features available in Chrome developer tools and their usage. Most of the content of the article can be extrapolated to Mozilla Firefox and Microsoft Edge developer tools. We will divide the article into sections on the basis of various panels available in Chrome developer tools of Google Chrome version 62. Go to the top right corner, click on Customize chrome (three vertical dots) -> More tools -> Developer tools. Right click on an element in website and select Inspect. Now, we will dive into each of the devtools panels one by one. Editing HTML/CSS, viewing applied and final computed styles. This is quite important while making small iterations in design and testing prototype changes. 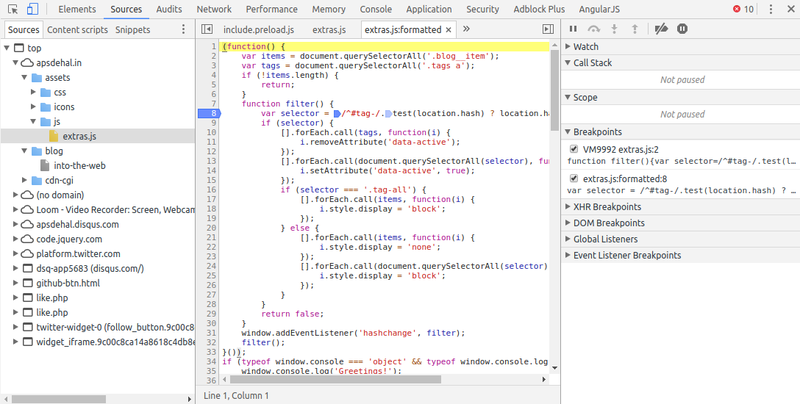 In the left pane, we can see the rendered HTML and how elements are nested in DOM tree. These elements can be edited to observe real-time simultaneous changes to the webpage. The right pane of elements panel can be used to see styles applied to an HTML element which can be enabled/disabled selectively to see a particular style’s effect. We can also see final computed styles after cascading and applying styles in Computed section. Event listeners attached to the element can also be seen in the right panel. Most common use-case of elements panel is to check HTML and DOM position of an element rendered on screen. This can be done by pressing right click on the desired element in a web-page and selecting inspect element. This will pop up elements panel with the desired element’s HTML highlighted. It also possible to hover over the HTML of an element to see its margin and padding which are green and orange respectively. Check bottom section of styles panel for more information. Bonus tip: It is possible to check applied CSS for various states of an element by selecting ‘:hov’ option in styles panel. 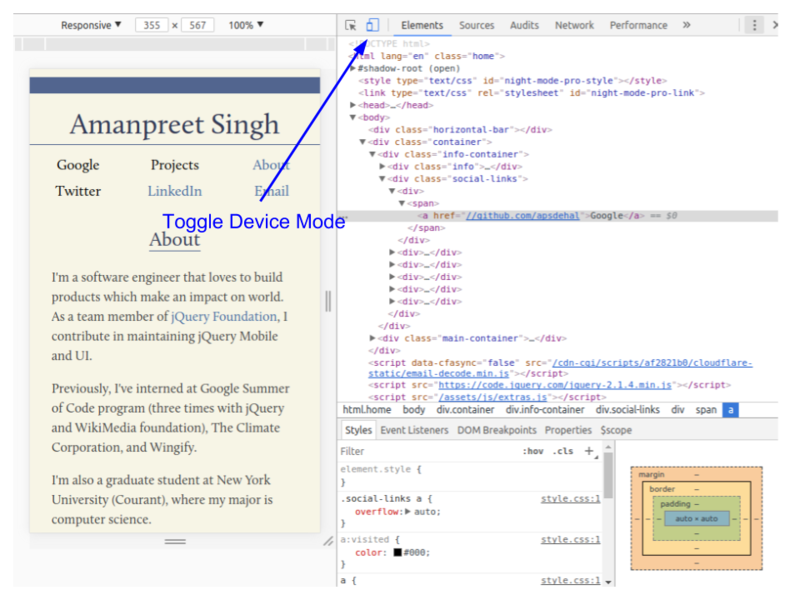 For building responsive websites, Chrome developer tools have ‘Toggle device toolbar’ (in top left corner) option which can be used to view the website in different resolution. It also has specific viewports for mobile devices such as iPhone, iPad, and Nexus. The code can also be directly edited through source panel. Enable breakpoint on any error. Add various types of breakpoints like event listener breakpoints (such as click) or DOM breakpoints (such as modification of tree). This panel can be used to identify common problems and issues that affect a website’s performance, accessibility and user experience. Audits use Google’s lighthouse project as a backend. The usual checks involve checking of standards for Progressive Web App, performance metrics, best practices and accessibility concerns. Just go to the panel and run an audit with desired options to get results. This panel can be used for monitoring any kind of requests made by a website. Response body and headers along with request parameters and headers are logged for each request. Network requests can be filtered either by type or domain. This panel would be the first place to go to while diagnosing a failed request. The failed requests are shown red in color with the respective HTTP status code shown with it. In case of a POST request, form data sent with the request can also be seen. Timing, which shows time-wise stats for the request and can be used for performance diagnosis. Capture screenshot for taking image of what is visible in viewport for the website. Cache disable for all requests from network panel. Bonus tip: Right click on a network request of interest and select one of the options to copy the request. Most frequently used option is copy as cURL which you can use to get cURL equivalent of the request and replay it in terminal. Web app’s manifest can be inspected and triggered using Manifest pane. Service Workers pane can be used to perform service worker related tasks like unregistering, stopping, going offline etc. 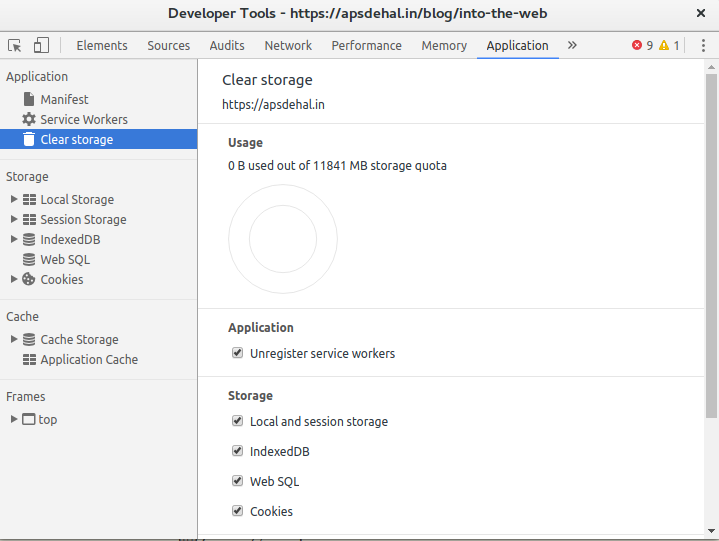 Service workers cache can be viewed using Cache Storage pane. Clear Storage can be used to clear all of the storage, caches and service workers. Frames pane can be used to organize resources by various filters. View and edit various storage and databases. Execute statements on a Web SQL database. Record Allocation Timeline: This recording helps in tracking down memory leaks in website’s JS heap. Start the recording, perform the action which you suspect of the memory leak, then press stop recording. Blue bars in the recordings represent new memory allocations. These are possible candidates for memory leaks and can be zoomed in to filter the constructor pane and then a particular object can be viewed in object pane. Bonus tip: You can enable FPS meter by pressing ‘Command + Shift + P’ (Mac) or ‘Control + Shift + P’ (Windows, Linux), typing Rendering and selecting Show Rendering. In Rendering tab, enable FPS meter to show an overlay on top right of your screen which shows FPS. This relatively new panel allows you to test your website for most common security measures. 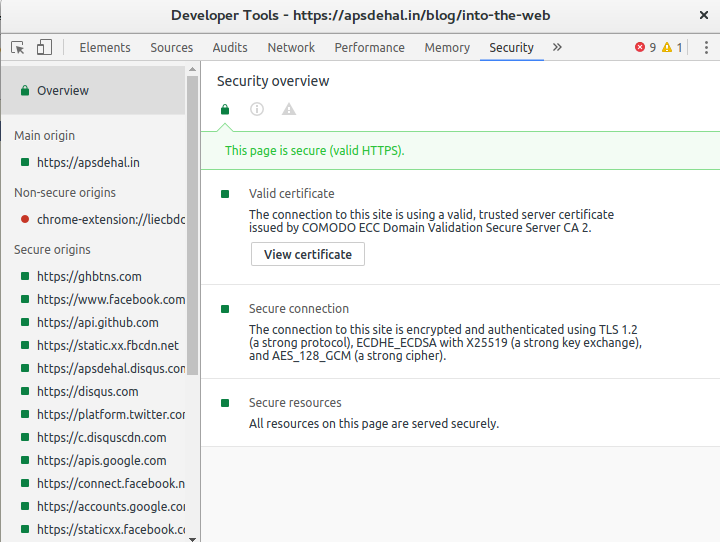 All of the origins of different resources are tested for valid SSL certificates, secure connection, secure resources and other things. Origins are further filtered into different categories based on non-secure/secure which allows easy tracking of issues. 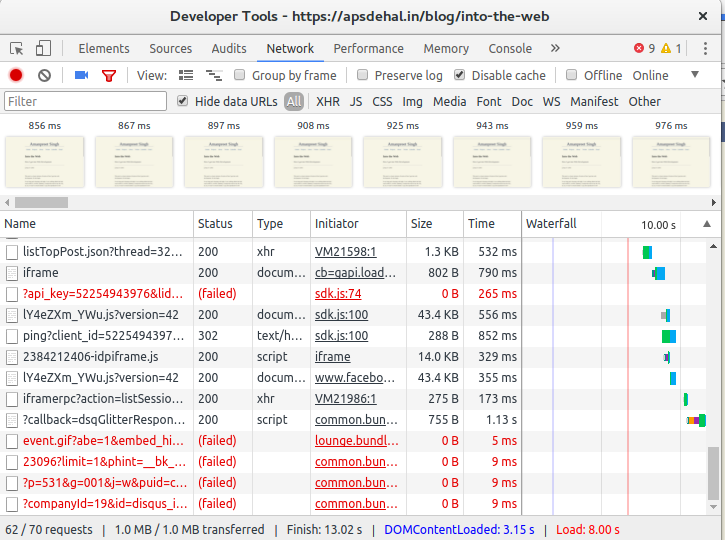 Just open up the developer tools, select this panel and reload your website to get an analysis. In future, more security tools may be added to this panel. Chrome developer tools can be easily extended to create extensions for different purposes, which can then be added as new panels. For e.g. popular devtools extension include extension for AngularJS, React. See this article by Google developers’ website on extending devtools for more information. Credits: Some of the images were taken from Google Developers’ Website on Chrome DevTools which are licensed under Creative Commons Attribution 3.0 License. 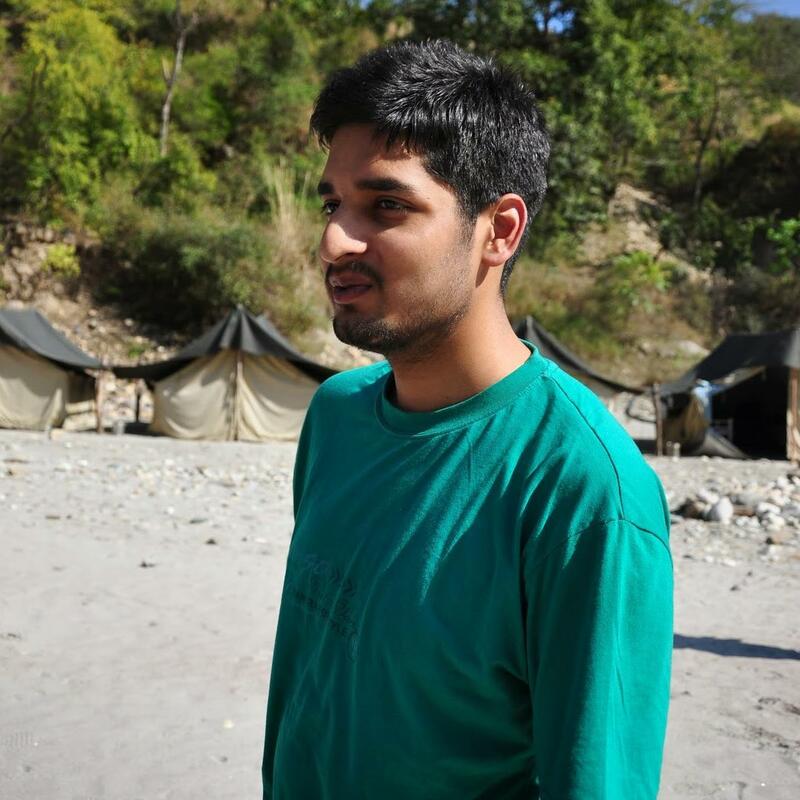 Amanpreet is a Masters in CS student at New York University with specialization in deep learning. He is also a member of jQuery Foundation where he maintains jQuery Mobile. Having interned at companies like Amazon and programs like Google Summer of Code, he has vast experience in developing full-stack applications. These days, he is mostly focusing on research in NLP, generative models and multiagent learning. A recent press release from International Data Corporation (IDC), has forecast the spending on IoT market to grow cumulatively up to 16.7 percent by 2017, worldwide, and is expected to reach over 800 billion USD.By 2021, this spending is expected to reach nearly 1.4 trillion USD, led by the company's investment services, connectivity, hardware and software that enable the IoT worldwide. "The discussion about IoT has shifted away from the number of devices connected and the true value of IoT is being realised when the software and services come together to enable the capture, interpretation, and action on data produced by IoT endpoints. With our Worldwide IoT Spending Guide, IDC provides insight into key use cases where investment is being made to achieve the business value and transformation promised by the Internet of Things"- said Carrie MacGillivray, vice president, Internet of Things and Mobility at IDC. The use cases of IoT that are expected to attract the largest investment includes freight monitoring, production asset management and manufacturing, that will attract the largest investments. The smart grid technologies for gas, water, electricity and smart buildings expect to see significant investment gains in the next few years. Long tail investments in smart home technologies and in-store contextual marketing will grow exponentially over the next five years in IoT market. The IoT hardware spending will be focussed on sensors and modules that connect end-points to networks, whereas software and services spending will dominate in the spheres of content, installation and IT services. As organisations are adopting new innovative services by different marketers, a lot of threats are found.To safeguard the system from these threats, it is very important to upgrade the existing security systems to establish optimal business outcome and justify ROI. In terms of industry investments, transportation and manufacturing have been making 85 billion USD and 183 billion USD respectively. More utilities are coming together for IoT technologies, with an expected spending of around 66 billion USD.